From fashion police to fashion plates, Mercedes-Benzhas never had a shortage of creativity when it comes to activating Fashion Week. 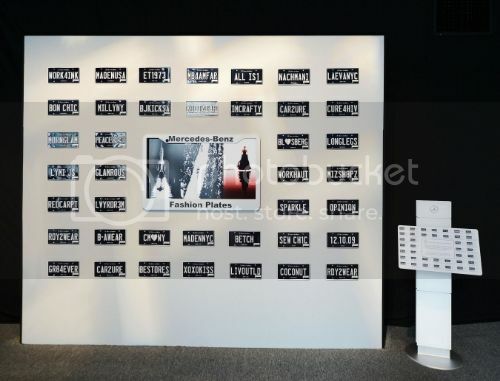 This year, to promote its all-new CLA-Class, a group of 30 designers and front row fashion influencers are participating in the Mercedes-Benz Fashion Plates initiative, creating custom license plates that will be on display throughout Mercedes-Benz Fashion Week at Lincoln Center from February 7-14th. The program reveals unique personal tidbits for some of the biggest players in fashion, including top designers such as Anna Sui , Badgley Mischka, Betsey Johnson, Carmen Marc Valvo and Jenny Packham; and key influencers including Karlie Kloss, Derek Blasberg and Danielle Nachmani. Tying the Fashion Plates theme back to social media, different plates will be posted to the Mercedes-Benz Facebook page with the original word sequence scrambled with clues to whose plate it is. The first 100 winners to identify the plate correctly will receive the Mercedes-Benz Fashion Plate CAR2URE featured on the SLS AMG Black Series. "Mercedes-Benz design is fascinating in so many ways providing the brand with a unique opportunity to position itself among the most important fashion labels in the world," says Danielle Nachmani, stylist for Mercedes-Benz. "There are only a handful of iconic fashion houses that can take luxury across every segment, but still hold true to its values and craftsmanship."